When a brand-new coffee roaster opens up right next door to Starbucks, well… you know it’s going to be good. That’s what happened when Caffe Ladro opened up its first shop in 1994 on Upper Queen Anne in Seattle, right next door to Starbucks. To be fair, it’s a quintessential Seattle tale; Everyone knows there’s room for more than one great coffee shop in the Coffee Capital. Caffe Ladro—now a Seattle institution which means “coffee thief”—has always had to work twice as hard to produce quality coffee that appealed to the masses and beat out its next-door neighbor. These days, Caffe Ladro has 15 locations in Seattle and the surrounding region. 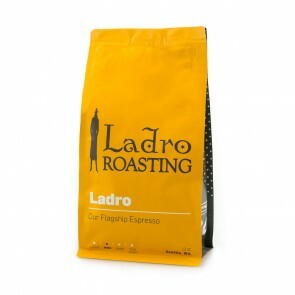 Ladro Roasting is unique in that it has a wide variety of single-origin beans and blends that change seasonally or may not be available for long. This small-batch coffee roaster specializes in top-quality Ethiopian and Costa Rican coffee, and owner Jack Kelly says he directly sources most of his beans from farms he’s personally toured. So, which one to try? For Ladro Roasting, it’s a true toss-up. 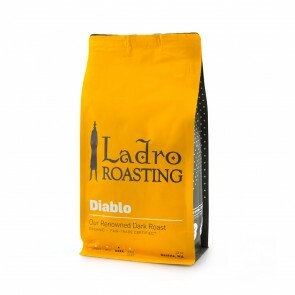 We recommend Ladro's Diablo Blend for a modern spin on a classic chocolate profile.